There it was. Sitting ever so beautifully on the table Claudia had set up for me when I did my book signing at Bell’occhio last Saturday. The above envelope that was ever so artfully addressed to me by a friend/co-worker of our beloved Whitney. That is a whole other story, but just know what was inside that envelope was equally if not more fabulous than the outside. But back to those gorgeous stamps. By now, you know my feeling on the importance of a hand-written note. They are becoming increasing rare these days, so their importance and specialness are even greater. A stamp, or here, stamps, can tie the whole thing together. They are akin to ribbon on a package. A well thought out stamp can be the cherry on top of the cake for the envelope. 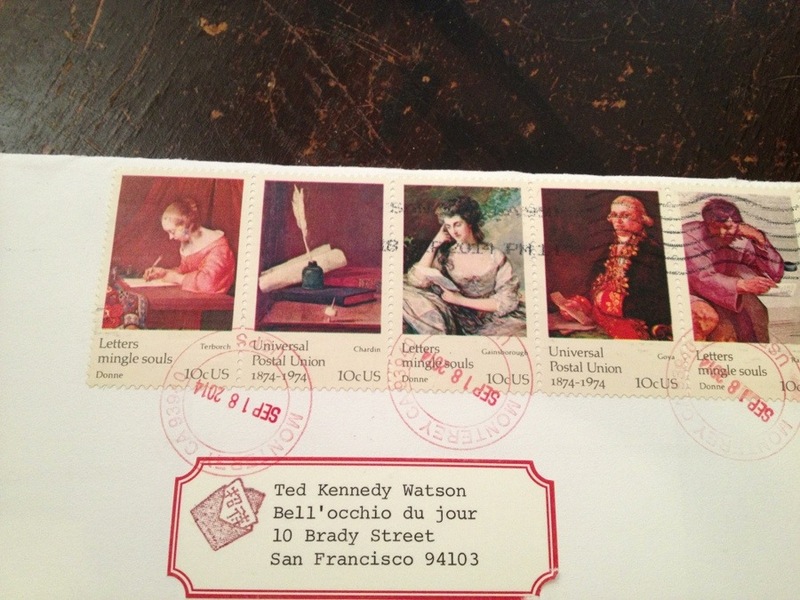 In this case, the sender also took the envelope to the post office and had them hand stamp it. A service many a postal clerk will gladly do for you. My point with this really is stamps can make a difference and make a note or letter just sing. When you are at the post office or on the postal service website ordering stamps, buy a few extra that you are drawn to. Start a small collection that you can pull from that you think adds to what you are sending. I promise you, the extra effort will rarely go unnoticed. I am so excited to be hopping on a plane Friday morning and heading to San Francisco for 2 books signings. If you are in the area, I so hope you can come to one of them. If you are not, but know someone in the Bay Area that you think would, please pass on this invitation. 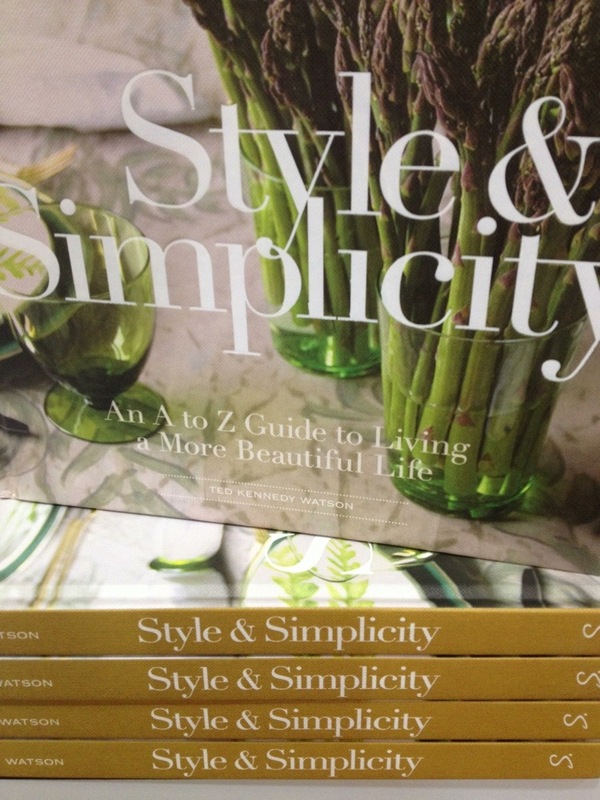 Friday evening September 19th, from 5 to 7, I will be signing copies of Style & Simplicity at the new glassybaby on Sacramento Street. Wine will be served and folks will get a chance to see all the beauteous range of glassybaby colors available at the moment. Sets of the ‘Style & Simplicity’ duo will also be available. 10% of the proceeds from the signing will go to The University of San Francisco Medical Center at Mission Bay to help cancer patients. Saturday afternoon the 20th, I will be at the heavenly shop Bell’occhio from 1:30 to 3 signing books. I have been shopping at Bell’occhio for close to 20 years, and the enchanted experience always leaves me beyond happy with a box being sent back to Seattle of glorious finds. Being a shopkeeper myself, I have such respect & admiration for those who do it well. Claudia, the owner has kept her shop inspiring after all these years. 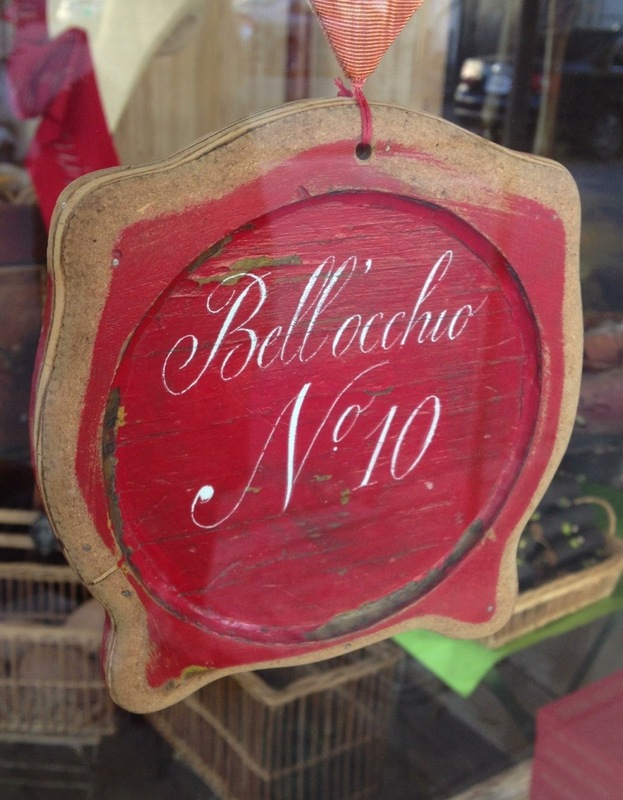 I am deeply honored to be signing copies of my book at Bell’occhio. A lovely Wednesday to you all. I was asked by a few folks at the shops about some of the places I visited while I was in San Francisco a few weeks ago. It really is such a special city. When I had my showroom, I used to exhibit at the show there twice a year. Spending a week there at a time, I feel like I got to know it well. There are so many “classic” spots that I stop at each trip, and then there are new places I hear about that I have to check out. I wrote 24 to 48 hours in the heading, because you really can see so much in just a day or two. Which I think makes it such a cool city for a quick, inspirational trip. Here is how this trip rolled. Good food, no make that great food plays such a big part in the enjoyment of SF. 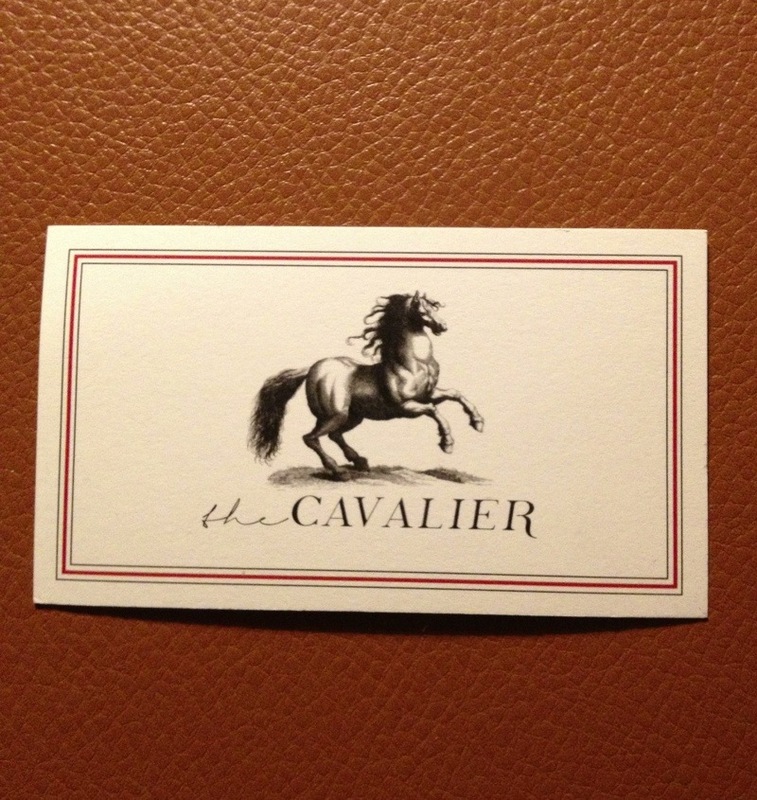 The first evening I had dinner at the Cavalier with our friend Grant K. Gibson. You might remember a past post about his photography we carry at the shops. 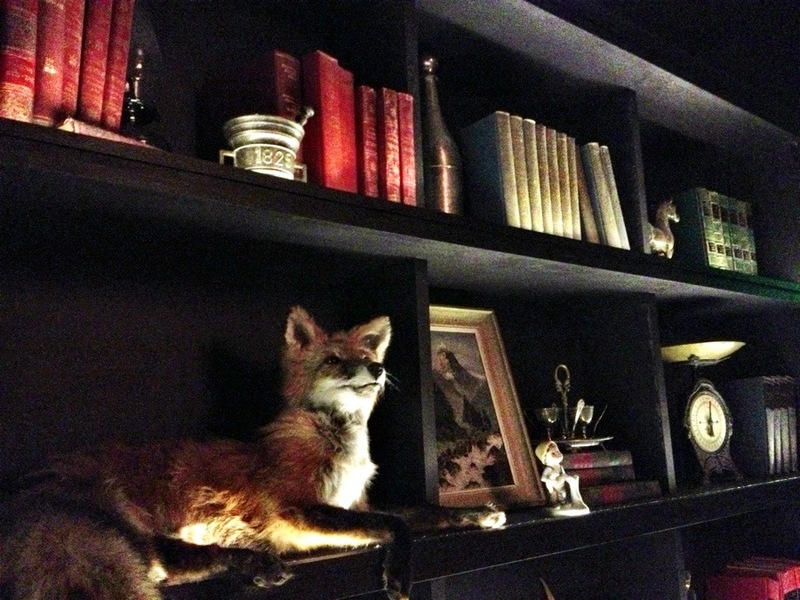 His full-time job is interior designer. The Cavalier was his recommendation and it did not disappoint. With interiors by Ken Fulk, it is as yummy to look at as the food–and the food was pretty darn tasty. Highly recommend. It is actually just a few blocks away from the Four Seasons, which is on Market Street, which is where I stayed. Such a lovely hotel, with such gracious service, and centrally located so it makes getting around a breeze. If you have one choice to dine on a quick trip to San Francisco, by all means grab a reservation for lunch or dinner at Zuni Cafe. My ritual on a SF trip is I have lunch there on the day I later fly home. I have done this always, and I always fly home happy. 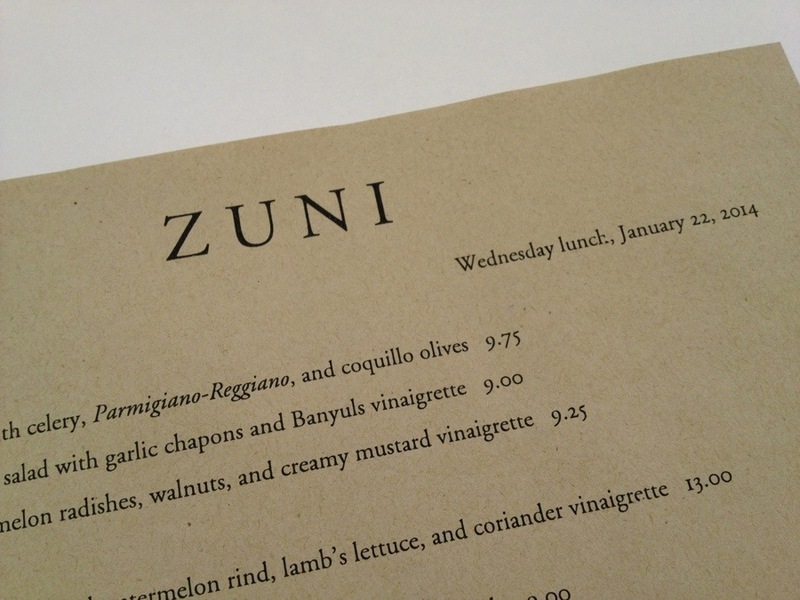 Zuni is one of my all time favorites. Simplicity on so many levels. 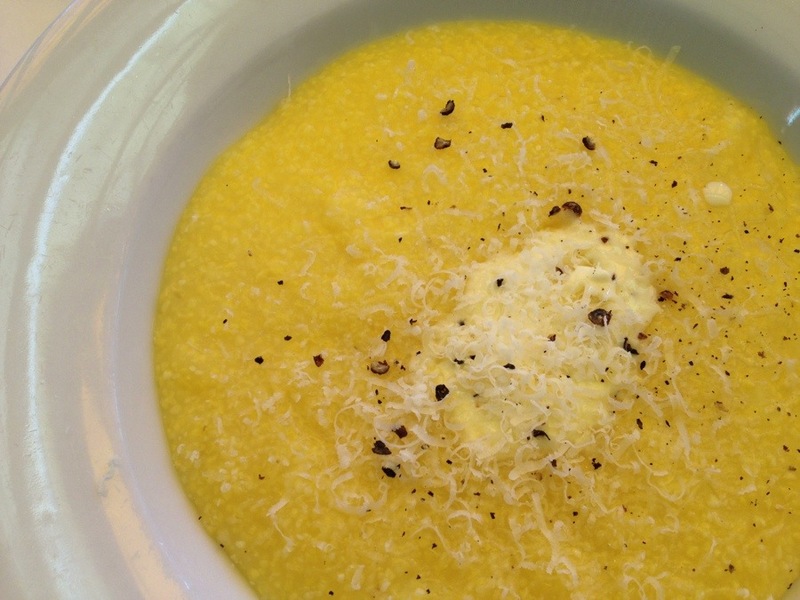 Just good, good food simply prepared that will knock your socks off. My other memorable meal was at Farmshop at the Marin Country Mart with my new friend Tolan Florence. 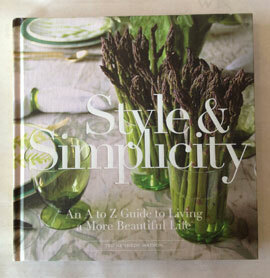 I was familiar with Farmshop in the Brentwood Country Mart in LA. This is their newest venture, and the meal and the space were just stupendous. Again, not fancy, just the best ingredients simply prepared to perfection. You take a walk-on ferry to Larkspur, and then it is just a few minute walk to the Mart. It is filled with sweet shops to peruse as well as a lovely bookstore. You catch the boat at the Ferry Building. You will want to arrive quite early, as you will want/need to spend a bunch of time at the shops here too. The San Francisco Ferry Building is really such a gem. Go hungry, as there are so many sweet spots to pick up things to nosh on. Shopping plays a big part in the SF plan. Bell’occhio is a must see. I have been going there for over 20 years. It is just magical. You walk in the door and you are just transported to a slower, more genteel time. I have gotten to know Claudia and her husband Tom over the years. If you stop in, tell her Ted sent you. It is about a 30 second walk from Zuni, so they always go hand and hand on my visits. Then there is a stop at Wilkes Bashford, Gump’s, Hermes, and Burberry–all just a few blocks from one another in the Union Square area. Hayes Valley is another fun area to walk around and shop at small shops. A quick taxi or Uber takes you to Sacramento Street for more shopping at Sue Fisher King, March and Hudson Grace. Then to Fillmore Street to Nest and a walk around to other shops on this busy and entertaining street. I used Uber quite a bit on this last trip. I was having the hardest time hailing cabs, so the Uber app was called into play often. We are really such fans of the service. It is also such a great waking city. I could just walk and walk and walk and people watch. The architecture is stellar. Remember to look up and to look down. 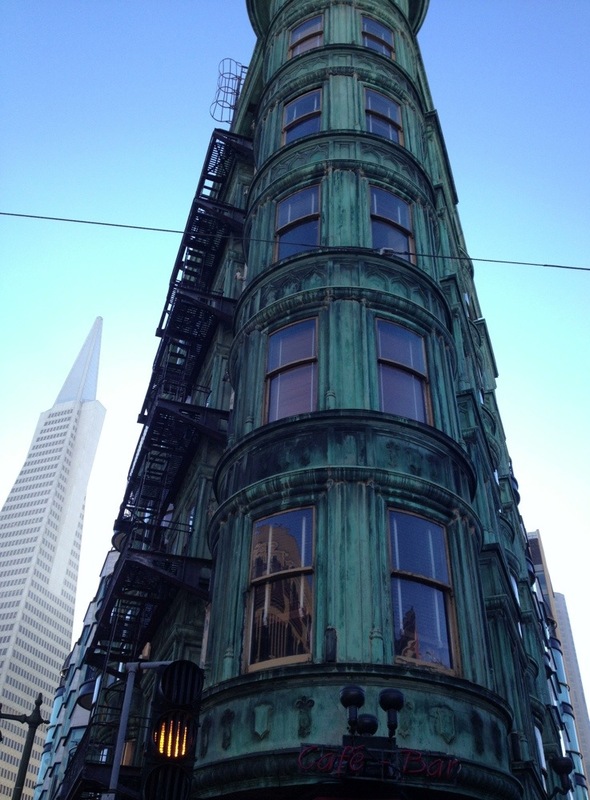 So much to see and do in this most wonderful of cities, San Francisco.